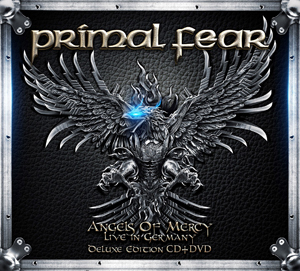 The German metal legends PRIMAL FEAR are returning with a vengeance on June 2, 2017 with a brand new live album/home video, entitled Angels Of Mercy – Live In Germany on Frontiers Music Srl! 2016 was a very busy year for PRIMAL FEAR. Following the release of their latest killer studio album, Rulebreaker in January, the metal warriors embarked on a world tour which shattered all the previously held records for shows played in one year by the band. The last tour unleashed the best PRIMAL FEAR performances since the band formed in 1998 - a consistently great mix of power, ambition, and enthusiasm filtered through the talent of these insanely great players! There is undoubtedly magnificent performances on this release, with great sound and video quality. This live album offers a barrage of metal anthems in their full glory that will please any headbanger! If you are a metal fan you, then you must see this in all it’s power and glory! The package will be released on CD/DVD and Blu Ray on June 2, 2017 with vinyl and a limited edition special box set in the works as well!